Beauty: We should remember that the liturgy is the public worship, which the Church, the Mystical Body of Christ, offers to God. Question: I am an older person and can remember Masses, Eucharistic adoration and hymns that were somehow truly uplifting. I don’t find that to the same extent anymore, except in a few parishes. Am I right to lament the loss of beauty in the worship of God? Answer: The liturgy should always be beautiful and I am sorry to say that I agree with you in that we have lost much of the beauty we had in years gone by. Why should the liturgy be beautiful? We should remember that the liturgy is the public worship, which the Church, the Mystical Body of Christ, offers to God. It is not merely the action of human beings but especially the action of Jesus Christ, the head of the Mystical Body, along with his members. The liturgy should therefore have a beauty and dignity that reflect its divine actor and object. 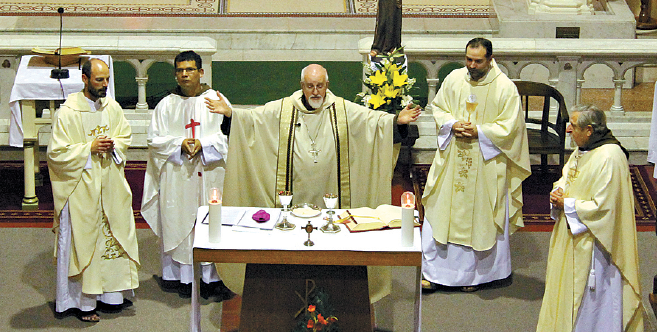 Moreover, the liturgy is a participation in the heavenly liturgy where the angels and saints constantly praise God, singing “Holy, holy, holy…” As the Catechism of the Catholic Church puts it, “It is in this eternal liturgy that the Spirit and the Church enable us to participate whenever we celebrate the mystery of salvation in the sacraments” (CCC 1139). In heaven we find the maximum of beauty: the beauty of God himself and of Our Lady, the angels and all the saints, in the splendour of holiness. We read in the Book of Psalms: “Honour and majesty are before him; strength and beauty are in his sanctuary” (Ps 96:6). It is only right then that the liturgy on earth should reflect as much as possible the beauty of heaven. In this sense, Pope Benedict XVI writes: “Like the rest of Christian Revelation, the liturgy is inherently linked to beauty: it is veritatis splendor (the splendour of truth). The liturgy is a radiant expression of the paschal mystery, in which Christ draws us to himself and calls us to communion. As St Bonaventure would say, in Jesus we contemplate beauty and splendour at their source”. Pope Benedict goes on to say: “The truest beauty is the love of God, who definitively revealed himself to us in the paschal mystery. The beauty of the liturgy is part of this mystery; it is a sublime expression of God’s glory and, in a certain sense, a glimpse of heaven on earth. The memorial of Jesus’ redemptive sacrifice contains something of that beauty which Peter, James and John beheld when the Master, making his way to Jerusalem, was transfigured before their eyes (cf. Mk 9:2). Beauty, then, is not mere decoration, but rather an essential element of the liturgical action, since it is an attribute of God himself and his revelation. These considerations should make us realise the care which is needed, if the liturgical action is to reflect its innate splendour”. In summary, the liturgy should be beautiful because it reflects on earth and praises God’s infinite beauty in heaven. Really, it is a matter of love. When we love someone we give them gifts which are truly beautiful – a diamond or gold ring, beautiful flowers, an elegant garment, a well-prepared meal. We should not do any less for God, the source of all beauty. All aspects of the liturgy should reflect this spirit – the church itself, the altar, the tabernacle, the vestments, the way of celebrating by the priest, the music. All should uplift the spirit and lead it to God. Our ancestors left us a great legacy in this regard, with their beautiful Gothic cathedrals, stained glass windows, ornate chalices and monstrances, magnificent vestments and of course spine-tingling, truly uplifting music. As the Catechism says, speaking of sacred art in general: “Sacred art is true and beautiful when its form corresponds to its particular vocation: evoking and glorifying, in faith and adoration, the transcendent mystery of God – the surpassing invisible beauty of truth and love visible in Christ… Genuine sacred art draws man to adoration, to prayer, and to the love of God, Creator and Saviour, the Holy One and Sanctifier” (2502). We should do all we can to foster this spirit in a liturgy which is well-prepared and carried out, so that it truly gives glory to God, the source of all beauty, and it unites us with him.